Nokia has unveiled its Nokia Lumia 800, originally codenamed as 'Sea Ray', along with the price, release date and specs. It's the Finnish company's first Windows Phone 7 handset and will sport three new Nokia services - Mix Radio, Drive and ESPN sports hub apps. 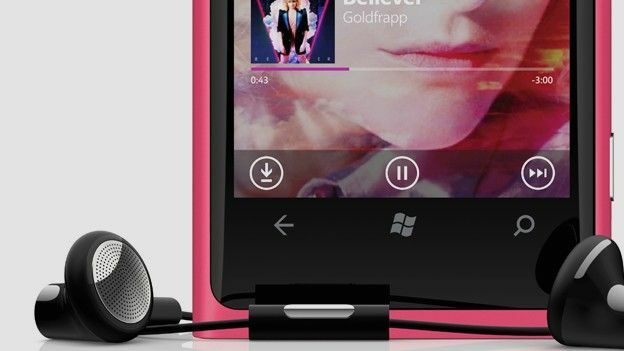 Clearly taking the design cues from the company's stunning MeeGo handset the Nokia N9, the Lumia 800 is what Stephen Elop has dubbed as the first 'the first real Windows Phone'. Nokia also launched a cheaper smartphone which is being marketed as a mid-range blower - the Nokia Lumie 710. With a 3.7inch ClearBlack AMOLED screen and the same polycarbonate shell that's found on the N9 the Lumia 800 is also powered by a huge 1.4GHz processor and comes with 16GB of internal memory and 25GB of cloud storage free via SkyDrive. You'll find on the back a 8MP Carl Zeiss lens with 720p HD-recording at 30fps, while on the side the same volume and camera shutter keys you'd expect on a Windows Phone 7 handset. You can find out more in our Nokia Lumia 800 review. Nokia also announced Nokia music, a spotify-esque service which allows you to stream mixes from the Lumia 800 and then download them as 'offline mixes' if you need too. There is also a top notch set of Nokia and Monster Purity HD headphones for personal sound time. Finally came the announcment that Nokia was working with ESPN to create what they believe to be the ultimate sports app for Windows Phone 7, by integrating players, teams and live streams into the app the user can create customised tiles depending on the player or the team. It's already shipping to the UK with an expected release date of early November, both Vodafone and Three have confirmed they will be selling the Lumia 800 and while there's no UK pricing available it will be sold in Europe for 420 EUR which comes in at around £360. It'll also come with Windows Phone 7.5 Mango and could well feature Nokia's own UI attached to the operating system. Stay tuned to T3 as we'll have hands-on of the new Lumia 800 shortly..